Mortgage Market Guide: GDP Weak. New Home Sales Strong. Last Week in Review: GDP was weak while New Home Sales flexed some muscle. Forecast for the Week: The Fed meeting and Jobs Report for April headline a busy week. View: Pump up your prospect base when you grow your connections on LinkedIn. “Let’s tell the future. Let’s see how it’s been done.” Suzanne Vega. Living up to low expectations, first quarter 2017 Gross Domestic Product came in weaker than expected. The first reading on first quarter 2017 Gross Domestic Product was 0.7 percent, below the 1.1 percent expected and below the 2.1 percent recorded in the fourth quarter of 2016. Within the report, it showed consumer spending dropped from fourth quarter 2016 to its lowest level since the fourth quarter of 2009. A mild winter and lower utility bills contributed to that decline. While these disappointing numbers could be a boost to Mortgage Bonds (and the home loan rates tied to them), there was some news in the report that is not Bond-friendly. The inflation-reading personal consumption component rose 2.4 percent, the highest since the second quarter of 2011. 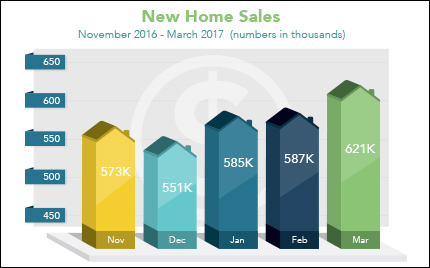 In housing news, the Commerce Department reported that March New Home Sales hit their highest level in nearly a year, up 5.8 percent from February to an annual rate of 621,000. Sales also were up nearly 16 percent from a year ago. New home inventories edged lower to a 5.2-month supply from 5.4 months in February. Housing prices continue to rise around much of the country. The S&P/Case-Shiller 20-city Home Price Index was up nearly 6 percent from February 2016 to February 2017, the quickest pace since 2014. Tight supply and strong demand continue to fuel home price increases. The French elections ignited a global Stock rally at the beginning of the week. Plus, there was more talk of tax and healthcare reform here at home, all of which helped knock Mortgage Bonds from their highs of the year. However, home loan rates remain attractive and near historic lows. If you or someone you know has any questions about loan products or home loan rates, please contact me. I’d be happy to help. April jobs data will help gauge if the weak March numbers were an anomaly or a precursor of what’s to come. A packed economic calendar kicks off Monday with Personal Income and Personal Spending, the inflation-reading Personal Consumption Expenditures and the ISM Index. Wednesday brings the ADP National Employment Report and the ISM Services Index. The Federal Open Market Committee (FOMC) meeting will take place Tuesday and Wednesday, culminating with the release of the monetary policy statement at 2:00 p.m. ET Wednesday. This always has the potential to be a market mover. On Thursday, weekly Initial Jobless Claims and Productivity for the first quarter will be released. Friday’s highly anticipated Jobs Report for April will include Non-farm Payrolls, the Unemployment Rate and Hourly Earnings. 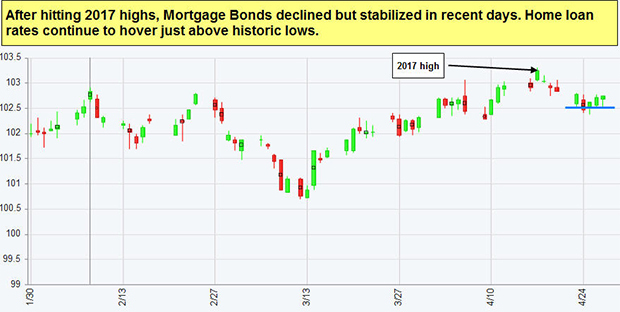 As you can see in the chart below, Mortgage Bonds have stabilized in recent days. Home loan rates remain near historic lows. LinkedIn is a great tool for growing your professional network, establishing referral partnerships and winning new business. Here are some best practices for growing your network and deepening the LinkedIn connections you have. Shoot for 500+ connections. People who search for a product, service or skill in your arena are more likely to see your profile if they have a 1st, 2nd or 3rd-level connection to you . A larger LinkedIn network can help provide that exposure. Also, as you reinforce your expertise with posting and commenting activity, you’ll have much more traction with a wider audience. Act on connection invitations. Whenever you accept connections, it broadens your 2nd and 3rd-level connection base. Establish immediate rapport with new connections by having a prewritten introduction you can quickly copy and paste into a direct message. Thank them for the request and invite them to contact you if they have any questions about your area of expertise. Regularly reach out. Budget a few minutes each day to make new connections with customized messages to prospective contacts. These might be individuals you find through keyword searches on LinkedIn, have recently read about in your local paper or e-newsletters to which you subscribe, or people you’ve met at community or professional events. Before you reach out, review profiles to find commonalities (three is ideal) and mention them. Stay tuned next week for even more quick and easy ideas for increasing your LinkedIn connections and growing a solid network.